An Argentine court has sentenced an ex- policeman, Julio Simon, to 25 years in jail for the disappearance of a couple and abduction of their baby in 1978. This is the first sentence against a former government agent for human rights violations since 2005 when the supreme court overturned amnesty laws. That ruling stripped former security force members of protection from prosecution for human rights abuses. Some 30,000 people disappeared during military rule between 1976 and 1983. 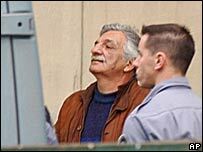 Kidnapping, torture and killing were widely used against suspected left-wing activists during the "Dirty War". Applause broke out in the Buenos Aires courtroom as the judgement was read. 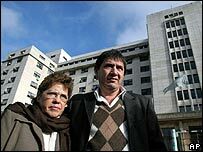 BBC South America correspondent Tim Hirsch says the ruling has broken new ground in the long and painful attempt by relatives of Argentina's disappeared to hold those responsible to account. Simon was charged in connection with the disappearance of a young political opponent of the regime, a Chilean named Jose Poblete, who had lost his legs in a train accident. He and his wife, also an activist, were taken into state custody with their baby in 1978, and the couple are assumed to have been murdered. The court found the ex-policeman criminally responsible for deprivation of freedom and for the abduction of their daughter Claudia - who is now 28. She had campaigned to get justice for her parents' disappearance after discovering her true identity six years ago. Amnesty laws passed in the 1980s had made it impossible to proceed earlier with the sentencing of former agents of the regime on human rights charges. But the laws were deemed unconstitutional in last year's supreme court decision, paving the way for convictions such as that of Simon, and others now likely to follow.